After a short break from Football Manager 2019, I’m now back in the swing of things with Fiorentina. After two 6th-place finishes in a row, my third season at the Artemio Franchi really is make-or-break. Either we end our long wait to return to the Champions League, or I end my Viola tenure in disappointment and return to England. The summer of 2020 has seen plenty of upheaval with regards to the playing and backroom staff. I’ve not left a single stone unturned as I look to take this great club back where it truly belongs. Let’s start the 2020/2021 season by clearing out some dead wood. Amongst several players to be released on free transfers was inside-forward Simone Minelli, who never followed his long-lost aunt Liza onto the big stage. Backup goalkeeper Daniele Padelli was also let go, after 18 months at the Franchi. Padelli wasn’t the only goalie to be deemed surplus to requirements this summer. Young Pole Bartlomiej Dragowski hasn’t lived up to his potential, and after a poor season on loan at Luzern, he has been sold to another Swiss club – Sion. Left-back Maximiliano Olivera was never more than a decent rotation option during his four years with Fiorentina. The brave Uruguayan will be staying in Serie A, having been picked up by newly-promoted Palermo for €4million. We also moved a couple of centre-backs on. You’ll remember I fell out with Federico Ceccherini two seasons ago over his limited first-team opportunities, but we parted on more amicable terms after he accepted a move to Verona. After three seasons playing for the Viola, Nikola Milenkovic crossed the French border into Marseille. There was never any doubting that the 22-year-old Serbian had bags of talent, but he was far too erratic and inconsistent for my liking. While €11.5million doesn’t seem like a particularly great deal now, I’m hoping my decision to sell up will look wiser in time. We couldn’t find a buyer for Riccardo Saponara, so the attacking midfielder will instead spend a season on loan in Switzerland with Lausanne. Rafik Zekhnini‘s long-term future at Fiorentina also looks far from certain. The flamboyant but frustrating forward has gone out on loan once more – this time to Strømsgodset in his native Norway – and we’ll properly assess his situation in the new year. Belgium beckoned for Emil Antonsen, who was loaned out to Charleroi after an excellent first pre-season with Fiorentina. I’m very excited about the 18-year-old Danish midfielder, and a full Pro League campaign will surely take his game to the next level. I’ll also keep a look-out for some other Viola youngsters who are spending the year on loan in Serie B. They include reserve striker Gabriele Gori, who caught my eye in pre-season but is still some way off being first-team ready. The same was true of left-back Luca Ranieri, who has plenty of potential and determination but needs to improve the mental side of his game. Gori and Ranieri were sent to Catanzaro and Perugia respectively. The coming campaign is a big one for Dusan Vlahovic, who didn’t quite kick on as I’d expected him to last season. A year leading Parma’s attack on their road back to Serie A could be the making of the strong Serb. I’ll also closely monitor centre-half Petko Hristov and forward Riccardo Sottil at Padova, and right-back Edoardo Pierozzi at Venezia. Now, what about two key players who didn’t leave? Germán Pezzella was highly-coveted by Napoli and Milan, both of whom submitted several miserly offers for the Viola captain. They both baulked at my €30million asking price, while a €45million tag around Marco Benassi‘s neck deterred Tottenham from making any bids for the wantaway midfield ace. Benassi wasn’t going anywhere, and that was that. Let’s start at the bottom of that list. I’m very excited about André Cerqueira – a 17-year-old Portuguese left-winger who cost us peanuts from Feirense and could go on to become a megastar. 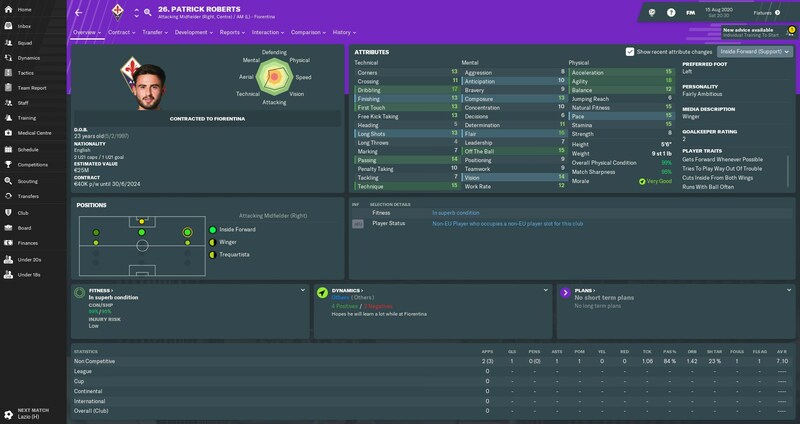 When he came back with a scout report rating of 90+ after being 100% scouted, I knew I’d found a potential gem. I needed someone who was cheap, relatively experienced, and preferably Italian to deputise for Lafont if need be. Francesco Bardi had spent a few seasons at Frosinone, and despite failing to take them back into Serie A last term, I felt the 28-year-old had enough about him to provide adequate cover. Bardi won 37 caps for Italy’s Under-21s in his younger days – a record he shares with a certain Andrea Pirlo. It’s about time I brought an English player to Florence, isn’t it? Patrick Roberts was available on a free after failing to break into Manchester City’s all-conquering team, but this agile left-footed, right-sided forward will get more opportunities here. Having previously managed the Londoner on FM17, I’m looking forward to some potential brilliance. Another option on the other flank is 21-year-old Romania international Alexandru Mățan, who actually wasn’t one of my signings. Our Head of Youth Development found him at the Viitorul academy club owned and managed by the great Gheorghe Hagi. I was amazed by Mățan’s performances for us in pre-season, but he’ll spend the coming season on loan at Rapid Vienna, as he’s not quite ready for Serie A. Now, this young Alex is ready for the top flight. Alessandro Bastoni is a tall and aggressive centre-back who could be the next man to follow a strong Italian footballing tradition. I had originally hoped to loan Bastoni in from Inter, but I put a cheeky €10million bid in to sign him permanently. To my utter surprise, the champions were happy to let him go for an extra million. My most expensive signing this summer was that of Lucas Tousart – the fearless and tireless ball-winner we’ve been craving. We’ve paid Lyon an initial €15million for the 23-year-old, with an extra €7.5million to come their way once he makes 50 league appearances in Viola colours. I’m still torn as to whether I want our midfield aggressor to be in front of the centre-halves or a little further up the pitch. Fortunately, Tousart is a natural in the defensive and central midfield positions, and he could even play at centre-half if we get absolutely desperate. Big things were expected of the huge Kurt Zouma not that long ago, but his Chelsea career never really took off. After a season on the Stamford Bridge fringes, we lured him to Italy on a season-long loan, which I might try to make permanent if he impresses. A guy with Zouma’s strength and aerial ability should be a rock-like presence at the back, not to mention a serious threat at set-pieces. Kurt also has the pace and acceleration to rush back and make any last-ditch recovery tackles, though his tendency to dive into challenges makes him a red card waiting to happen. It’s a risk I’m willing to take. Having had success with loaning in one Monaco wonderkid striker last term, we’ve brought in another for this campaign. Willem Geubbels will still be a teenager for one more season, yet he already has two senior caps for France and experience of scoring in a major league for Hoffenheim. Oh, hang on. What’s this? Ah, yes. Pietro Pellegri is returning for one more year at Fiorentina after all! To be honest with you, I was convinced Monaco would blood Pellegri in their senior team this season, but I kept him on my shortlist just in case. The Ligue 1 giants suddenly made the teenage wonder available for loan again in early August, so I quickly swooped in and brought him back ‘home’. Pellegri was our top scorer last season, with 17 goals (plus eight assists). I’m looking for him to get at least 20 goals and 10 assists this time around if we are to qualify for the Champions League. There was a massive staff overhaul over the summer, with 17 men coming in and another 12 losing their jobs. Most of the additions were to our Primavera coaching teams, with the Under-18s squad receiving special attention. Amongst those who joined that set-up was Fabio Grosso, who you might remember scored Italy’s winning penalty in the 2006 World Cup Final. He’ll work alongside our new youth-team manager Moreno Longo. As far as the senior team was concerned, the biggest changes saw Hugo Oliveira and Andrea Tonelli appointed as goalkeeping and defensive coaches respectively. The data analysis team received a significant makeover and is now headed by American Ryan Needs, who worked with Garry Monk at four different clubs. We had six warm-up matches before the new season, but our preparations were disrupted by the Olympic Games in Japan. Five Fiorentina players had been called up to represent their countries in a football competition that nowadays has arguably as much relevance as the Scottish Challenge Cup. Our pre-season began with a couple of matches in Turkey. After travelling to America and China in the previous two summers, why were we touring Turkey, you’re probably asking? Well… one of our new data analysts is Turkish, so it seemed a logical choice. Local minnows Kepezspor were completely outplayed in the first half of our first friendly. Reserve striker Gori claimed his first senior goal for Fiorentina, either side of strikes from Pezzella and Domenico Berardi. We then eased off in the second period, though Ceccherini had just enough time to get one last goal in before his move to Verona. Soon after that match, I got a surprise call from the FA, who offered me the England job there and then. Gareth Southgate had packed his waistcoat after a dismal European Championship, and I had been identified as the best man to lead the Three Lions into the 2022 World Cup in Qatar. Sadly, my ongoing work with Fiorentina meant I had to reject the offer… so the FA poached Sean Dyche from Burnley instead. Brexit means Brexit. Süper Lig side Antalyaspor put up a bit of a fight, registering as many shots on target as we did. Crucially, we were just that little bit more clinical. Seeing Santi Mina find the net was encouraging after his first-season struggles, and Antonsen later secured victory with a maiden Viola goal. We battered Brescia upon our return to Italy, though it helped a lot that the Serie B side had a man sent off after just eight minutes. In a repeat of our previous match, Mina and Antonsen put us 2-0 up. Young widemen Mățan and Tòfol Montiel got in on the act after the break, sealing a 4-0 win in a dominant display. Unfortunately, Cristiano Biraghi picked up a thigh strain midway through the first half. That meant our main left-back was likely to sit out the first few matches of the league season, with David Hancko set to take his place for the time being. Next up was a trip to Monza – best known for being the home of the Italian Grand Prix and (briefly) Roy Race. Just like Lewis Hamilton, we hit the front quickly, with yet another Berardi penalty and a scrappy Gori strike putting us 2-0 up at the break. Jordan Veretout later put the result beyond doubt, though our Serie C hosts did bag a late consolation. Arguably our most impressive attacking performance was at home to Marseille – albeit a very weak Marseille team who’d left most of their decent players at home. We didn’t even get to see our old friend Milenkovic for one last time. Valentin Eysseric opened the scoring before Mina netted from the spot, Roberts opened his Viola account, and Abdou Diakhaté topped it all off. As pre-seasons go, that was very promising. 17 goals was some return from those first five games, and the stalemate with Atlético suggested that our defence had greatly improved over the past 12 months. Indeed, we only conceded a single goal over the course of our warm-up matches – against Monza, of all teams. Of course, one could argue that this pre-season had been just a little too easy for us. We coasted through most of our games and rarely faced any major tests, which could come back to bite us when we play higher-calibre opponents in Serie A and the Europa League. Another minor gripe was that five important players were away in Japan while the rest of the team was planning for the new season. While going deep into an international tournament can’t have done the likes of Benedetti and Chiesa too much harm, they will need time to rest and then readjust to our tactics. It could be a while before they’re back to their best for Fiorentina. So just to confirm, these are our goals for the new season. I’m expecting us to reach at least another Quarter Final in the Europa League. It’s still annoying me that we didn’t do ourselves justice over two legs against Inter in April, so anything other than another lengthy run will be unacceptable. A Quarter Final place is also our minimum expectation in the Coppa Italia. Our quest to better last season’s runner-up finish will again start in Round 1, where we’ll host either Bologna or recently-relegated Cagliari early in the new year. Then we come to Serie A. The board would have been content with yet another top-six finish, but I’m definitely not. As I’ve stated before, we must finish in the top four and qualify for the Champions League this season, or that’s it for me at the Franchi. The players are certainly determined to take that extra step, in the knowledge that they’ll receive substantial bonuses if they succeed. We’ve not got the easiest start on paper to our Serie A campaign. Just like last time, we kick off against Lazio, though we’ll be at the Franchi instead of the Olimpico. Our first away match is a tricky one against Torino, and that’s followed by a home meeting with Bologna, who are always troublesome opponents themselves. You’ll find out how we get on in those opening three fixtures in Part 24. I’ll also have a new squad and tactics report ready for you by Wednesday, if not tomorrow evening. In the meantime, do check out The Wide Playmaker’s latest post, where he begins the second season of his “Florence And The Goal Machine” story. This entry was posted in FM19, Shades of Deep Purple and tagged Fiorentina, FM19, Football Manager 2019 on 3 December 2018 by Chris Fuller. I hope I stay for a bit longer too, because I’m absolutely enjoying managing Fiorentina right now. This is just a short-term career before I start my main save in the new year, so I really need us to kick on soon. Things are certainly looking positive right now, though. Who is your main save going to be with ? As I stated in my ‘Plans for FM19’ post, I will be managing Shrewsbury in League One. Floreat Salopia: Season 3, Part 5 – THE END?